This article series defines plumbing vent system terms, distances, and functions, and other specifications and code requirements. Here we include definitions of plumbing vent terms, types of plumbing vents, plumbing vent size requirements,and in a companion article we give plumbing vent clearance distances to building roof, vertical walls, nearby windows, or plumbing vent distance to chimneys. We explain how plumbing vents work on buildings, why plumbing vent piping is needed, and what happens to the building drains when the vent piping is not working. We define the soil stack, waste stack, wet vents and dry vents, and we summarize the distances permitted between plumbing fixtures and their vent piping. We also explain how sewer gas odors may be traced to plumbing vent problems. Contact Us by email if you are having trouble finding the information you need. Take a look at the complete index to this article series found just below, or go immediately to PLUMBING VENT DISTANCES & ROUTING. 1. Allow building drains to flow freely by allowing air into the drain system, avoiding the vacuum and slow drainage that would otherwise occur at fixtures. Imagine a full soda bottle with its cap off, turned upside down: the soda does not flow nicely out of the bottle. As some soda spills out, the spillage has to nearly stop to let some air into the bottle to fill the vacuum created by the soda leaving. Now perform the same experiment, but punch a hole in the bottom of your soda bottle just before you turn it upside down. Because air can easily enter the bottle the soda flows nicely out of the bottle mouth. 2. Allow sewer gases to be vented safely outdoors. Because sewer gases may flow back up into the building drain piping from a public sewer or private septic system, and because some sewer gases are included in building waste flowing through the piping, the plumbing vent system needs to carry these gases outside, usually above the building roof, where they are disposed-of safely and without leaving unpleasant, or possibly dangerous smells and gases inside the building. One-way valve designed to allow air to enter the plumbing drainage system when negative pressures develop in the piping system. The device shall close by gravity and seal the vent terminal at zero differential pressure (no flow conditions) and under positive internal pressures. Above, a Studor® Redi-Vent Air Admittance Valve from IPC Corporation. Where a conventional plumbing vent system is not available or not feasible the local plumbing inspector may permit an air admittance valve to be installed. An AAV is basically a one-way valve that allows air to enter the drain to satisfy the vacuum caused by water passing down the drainage system, but that prevents sewer gases from backing up through the vent into the building. 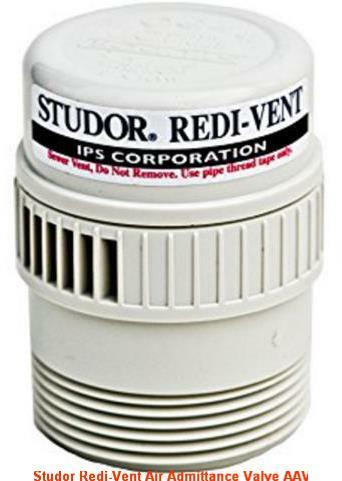 While the term "studor vent" is widely applied to describe an air admittance valve, Studor Mini-Vents as well as Redi-Vents are products of Studor Inc. & the IPS Corporation and are a brand name. A common example of an air gap in a drainage system is found at the connection of a clothes washing machine to a vertical standpipe connecting the washer to a drain line. Air conditioning condensate pump drains and water softener regeneration/backwash drains also often connect using an air gap or air break. Pressure created by any means in the water distribution system, which by being in excess of the pressure in the water supply mains causes a potential backflow condition. A backflow preventer is a device or means to prevent backflow. Let's convert these circular-sounding definitions into plain talk. We don't want water in the water supply system to ever flow backwards out of the building into the water supply source such as back into a drinking water well or back into the municipal water supply system because we can't guarantee our neighbors that water in our building piping, fixtures, toilet cisterns, etc. has remained sanitary and safe to drink. How might this happen? Suppose the building water supply system pressure is sitting at 70 psi on the building-side of a water pressure regulator at the incoming water supply line. And suppose the municipal water supply system temporarily loses its pressure. Unless a backflow preventer or check valve has been installed, building water may flow backwards into the supply system. Similarly we don't want wastewater in the drain system to ever flow backwards from the sewer or septic system back into the builiding because a sewage backup is unsanitary, nasty, gross, and a mess to clean-up. defined in the 2006 UPC as A pressure less than or equal to 4.33 psi (29.88 kPa) or the pressure exerted by a 10-foot 3048 mm) column of water. The backflow of potentially contaminated water into the potable water system as a result of the pressure in the potable water system falling below atmospheric pressure of the plumbing fixtures, pools, tanks or vats connected to the potable water distribution piping. We prevent these backwards flowing water or wastewater problems by installing the proper type of check valve at the proper locations in the building water supply or drain system piping. An elevation (height) reference point that determines the minimum height at which a backflow preventer or vacuum breaker is installed above the flood level rim of the fixture or receptor served by the device. A backwater valve is found on a drain pipe so it's technically not part of the building vent piping system but we included it here in response to reader questions. Also see backflow preventers and check valves used both drain systems, water supply systems, and mechanical systems such as heating boilers. - Ed. A vertical measurement of distance, 8 feet (2438 mm) or more in developed length, between the connections of horizontal branches to a drainage stack. Basically,larger piping diameter allows longer distances between a plumbing fixture and its vent stack. If a plumbing fixture is located too far from the main building vent stack, then its own drain pipe must have its own vent stack connection piping. But if a plumbing fixture is close enough (five feet or less) to the main waste stack pipe (vent), the fixture does not usually require its own plumbing vent piping, and it is considered a direct-vented plumbing fixture. Of course this rule presumes that the drain piping between the fixture trap and the waste stack is properly installed and properly sloped. The usual slope on the fixture drain piping is 1/4" of slope per 12" (foot) of horizontal distance or "run" of piping. Drain Fixture Units or DFUs used in sizing air admittance valves or drain waste or vent piping are calculated using a table or formula that assigns a number or weight to each type of fixture on a drain system. The total number of DFUs determines the required drain or vent size necessary for proper drain and waste disposal and venting. See DRAIN FIXTURE UNITS DFUs for details. A re-vent or revent pipe in a plumbing drain-waste-vent or DWV system is an auxiliary vent that is attached to the drain pipe close to an individual plumbing fixture. The re-vent or revent pipe is routed upwards above the fixture and then horizontally over to a tee that attaches it to the main stack vent pipe. 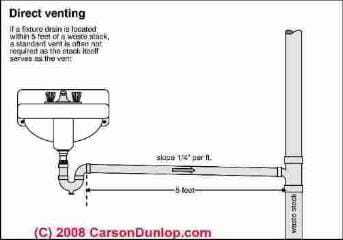 At the fixture the revent pipe can connect immediately behind the plumbing fixture or it may be connected close to the fixture along a horizontal drain line that serves that fixture. 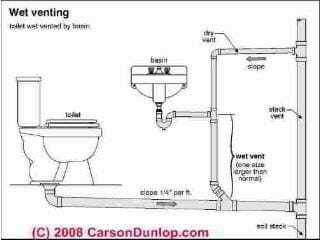 Definition of a plumbing relief vent. 917.3.2 Relief vent. Where the horizontal branch is located more than four branch intervals from the top of the stack, the horizontal branch shall be provided with a relief vent that shall connect to a vent stack or stack vent, or extend outdoors to the open air. The relief vent shall connect to the horizontal branch drain between the stack and the most downstream fixture drain connected to the horizontal branch drain. The relief vent shall be sized in accordance with Section 916.2 and installed in accordance with Section 905. The relief vent shall be permitted to serve as the vent for other fixtures. Also see AIR ADMITTANCE VALVES AAVs. What is the Plumbing Stack Vent? Here we show the main building vent pipe, the plumbing stack vent, connecting inside plumbing drains to a vent pipe that extends above the building roof in order to let needed air into the drains and to vent sewer gases harmlessly above the building. Below we explain how building plumbing vent systems work and why plumbing vents are needed for drain function and plumbing drain safety. Above the roof plumbing vent height: vent pipes should extend to outdoors above the building roof and should terminate vertically not less than 6" above the roof surface (nor more than 24") and must be at least 12" from any vertical surface (such as a nearby sidewall). (UPC (i) 906.1 and 906.2). Note that there are other restrictions: for a roof that is also used as an occupied space, for example, the vent has to extend at least even feet above the surface and be secured with stays. Above roof plumbing vent diameter: in areas exposed to snow or freezing or temperatures below 0 degF., that can block a plumbing vent, the vent pipe should be at least 2" in diameter beginning at least one foot inside the building in an insulated space before the vent passes through the roof. 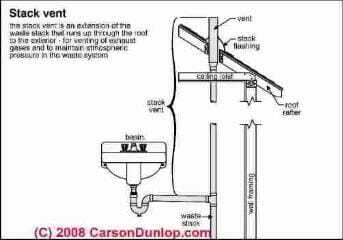 Where there is a snow-cover risk (snow can block the plumbing vent) the vent should extend 24" above the roof surface. 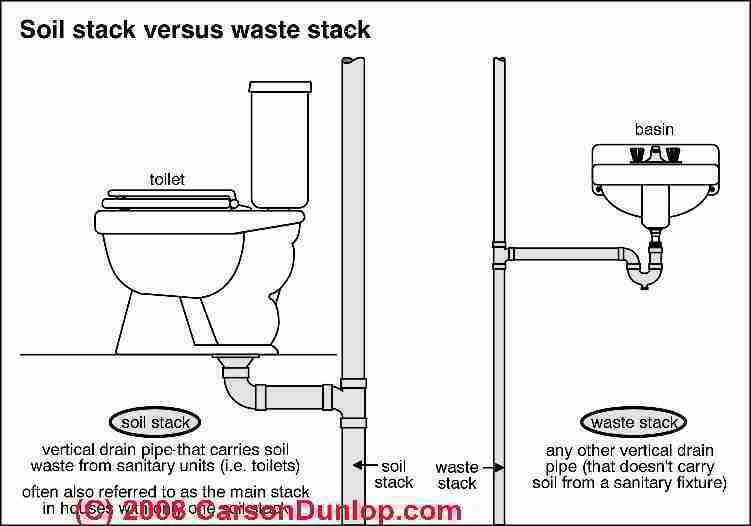 What is the Difference Between a Soil Stack & a Waste Stack? The soil stack pipe, as shown in Carson Dunlop Associates' sketch, carries waste from toilets to the house trap (if one is installed) and there connects to the sewer line extending outside the building and on to a public sewer or private septic system. The soil stack is the large-diameter main vertical waste pipe or building drain, or vertical portion of the "main drain" in the building. The soil stack pipe is normally extended outdoors above the building roof, as shown in the page top sketch. Other main building drain piping sections that slope closer to horizontal are connected to the soil stack but move waste horizontally where needed in a building. 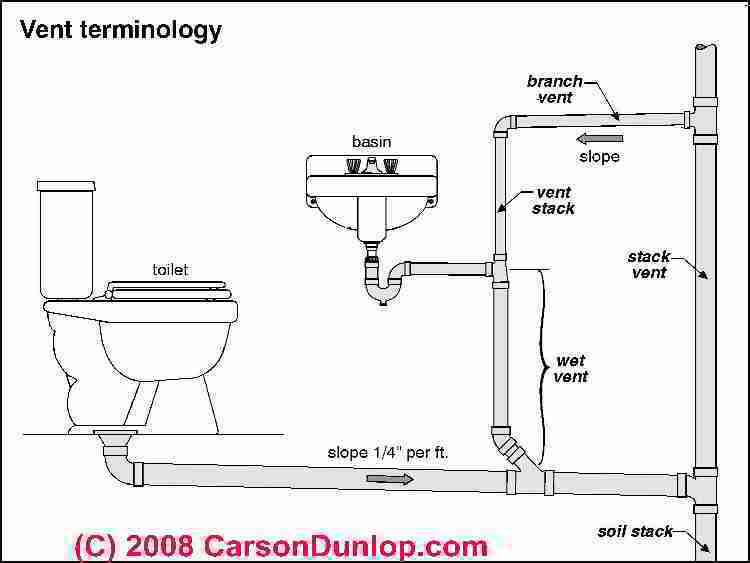 The waste stack pipe shown in the sketch refers to any other vertical drain piping in the building that does not carry soil (sewage) from a sanitary fixture (toilet). Typically waste stack piping carries drainage away from sinks, tubs, and showers. Definition of Wet Vent, What is a Wet-Vented Plumbing Fixture? A standard plumbing vent pipe is always dry; water runs down the drain line but the vent portion of the piping is dry. NO water runs in it. 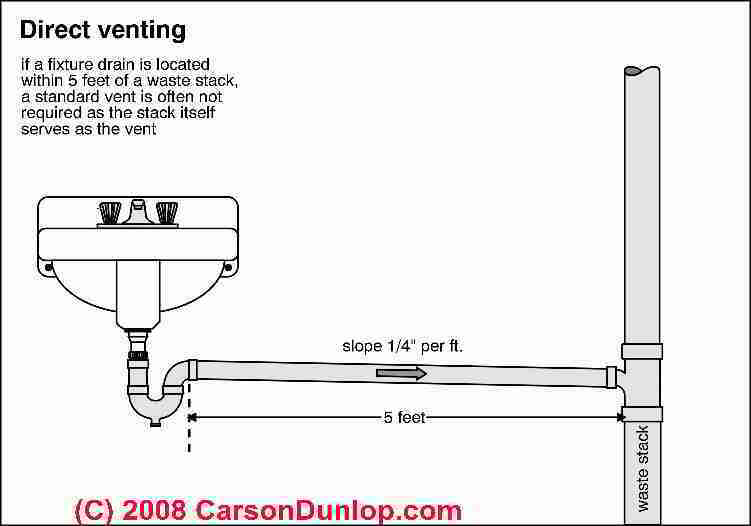 In contrast with a classic or standard "dry" plumbing vent pipe, a wet vent is a combination drain line and vent line. To work successfullly, the wet vent piping must be large-enough in diameter that it will never fill with water, thus allowing air to enter the drain system simultaneously with the passage of wastewater draining from fixtures connected to the wet vent system. In many buildings we find that the toilet is located quite close (within 5 feet) of the main building waste stack. This makes sense because the toilet needs really effective venting. Our sketch above shows a toilet located close to the waste stack - an installation that should work fine. When you flush a toilet it sends a sudden large volume of waste and wastewater into the building drain waste vent (DWV) piping. This surge of wastewater can certainly create a vacuum problem in the waste line if the vent piping system is inadequate, blocked, or missing entirely. It is exactly this condition that produces the gurgling or even siphonage out and loss of water in nearby sink or tub traps when you flush a toilet in a building where the vent piping is inadequate. A toilet that is located too far from the soil stack can be wet vented as shown in Carson Dunlop Associates' sketch. 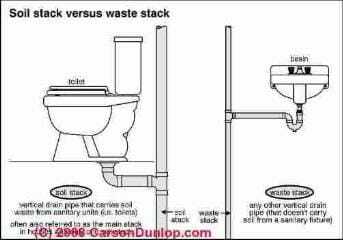 The drain piping for a sink (basin) or other fixture located closer to the soil stack than is the toilet can provide a pathway to let air into the horizontal waste piping used by the toilet to carry waste to the soil stack. Also note that wet vented fixtures (toilet, bathtub, shower, or floor drain) are permitted for bathrooms on the same floor level, not between floors. On tall buildings (often considered 11 stories or higher), prevent drain venting problems that could occur due to pressure variations in the stack vent system. A yoke vent, basically an offset relief vent, may be installed on every 5th floor from the top floor downwards. A yoke vent is any pipe that connects upwards from a soil stack or vertical waste stack to a higher location in order to prevent pressure changes in the stack pipe. Those pressure changes could prevent proper drain venting. In a typical arrangement, a yoke relief vent or yoke vent is constructed by using a 45 degree wye on a soil pipe or waste stack. The wye points upwards and connects using a second 45-degee connecting wye to a separate vertical vent stack pipe at a point higher in the building and usually above any other branch vents that connect to the same vent stack. The yoke vent pipe diameter is typically the same as (per code below) or one pipe size smaller (per local authority) than the drain and vent stacks to which it connects. 917.3 Offset Reliefs Such offsets may be vented by installing a relief vent as a vertical continuation of the lower section of the stack or as a side vent connected to the lower section between the offset and next lower fixture or horizontal branch. 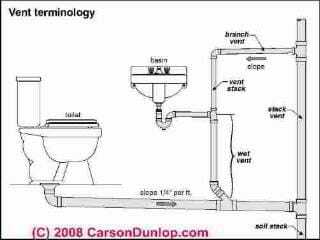 See ISLAND SINK PLUMBING VENTS for an illustration of and a discussion of the application of yoke vents. Loop vents may be used at island sinks or "free-standing sinks" where there is no direct route from above the sink's flood rim to a vertical vent stack. To keep the loop vent dry, that is so that the vent can work without flooding, the loop vent has to connect at the top of the fixture's vertical drain line, and the horizontal portion of the revent pipe must be at least 6-inches above the flood rim of the sink or other plumbing fixture being vented. The flood-rim is the highest possible point that water can rise in the fixture, or the actual horizontal rim of the sink if there is no sink overflow feature. See ISLAND SINK PLUMBING VENTS for details. Also see AIR ADMITTANCE VALVES AAVs or Studor vents. 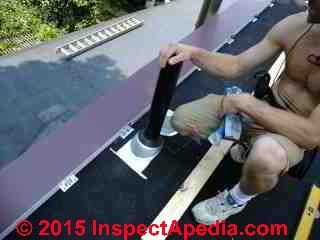 Within the building the plumbing vent routing is generally unrestricted. That is, dry vent piping carrying only air, sewer gas, or moisture to above the roof line is unrestricted. However the piping does need to be protected from nails - use nail plates to protect vent and drain piping both where where piping passes through studs, joists, or rafters. Special routing and connections are required for proper venting of plumbing fixtures such as kitchen island or peninsula sinks or dishwashers - plumbing fixtures that are located where a direct vertical vent stack connection is not possible. We had a plumbing inspection where he stated: Plumbing Venting tees - installed backwards.. He gave no indication where or how many.. or will answer calls for questions. We are a homeowner doing our own work, so just trying to narrow it down. From this can you help identify if at least..
3. what does "backwards" mean?? upside down, using wrong piece..? I cannot give an accurate guess at exactly what's wrong where from your question. 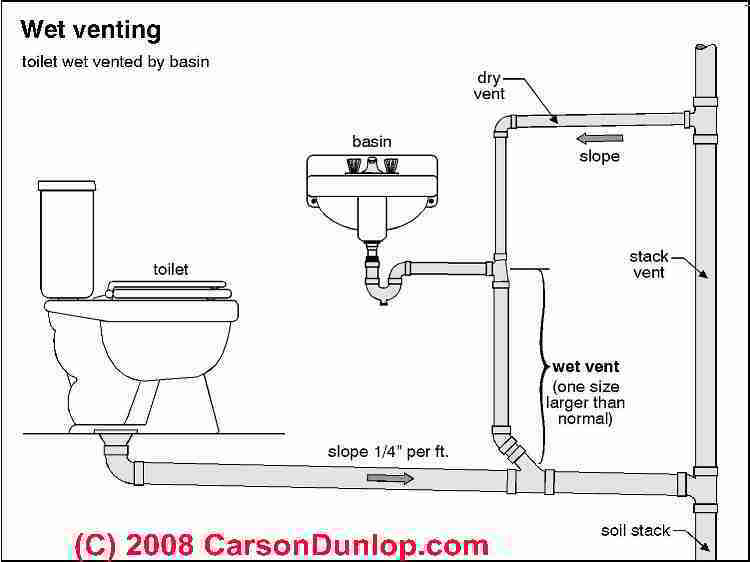 A plumbing "tee" is a drain pipe connection that joins a horizontal (well sloped 1/4" per foot but roughly horizontal) drain or vent pipe to the vertical vent or wet vent drain pipe. 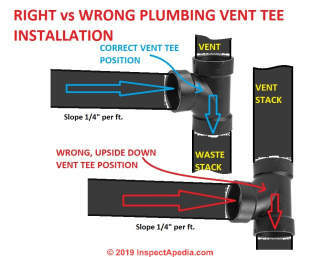 But I think that your inspector says that plumbing vent tee connections like those I show in our illustration are installed upside down so that water down a wet vent won't fully drain into the vertical drain line and vent stack. Follow the vent piping in your building, locate all joints, connections, tees, photograph them, and post photos here or ask the inspector to be more specific if some but not all connections were improper. 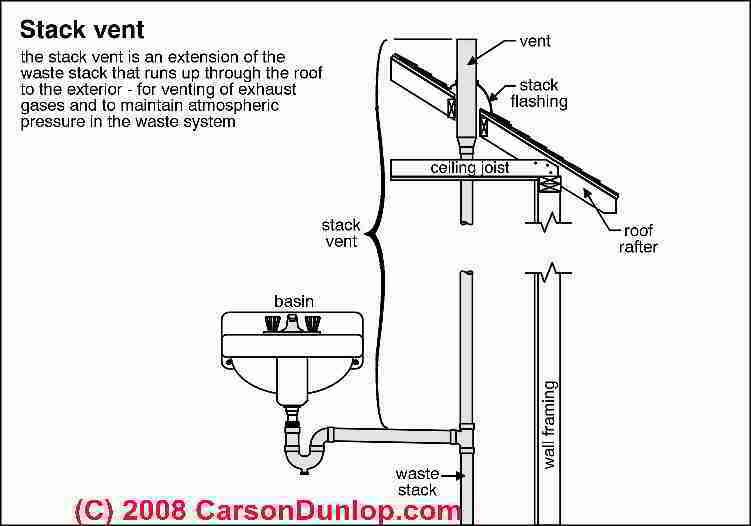 Our illustration shows the proper as well as an "upside down" position of a plumbing vent tee. Note that if the tee, seen at the vertical plumbing vent riser, were upside down, water would be trapped in the horizontal piping, ultimately inviting clogs. Use the "add Image" button (one per comment) and post photos of your plumbing drain and vent piping tee connections and we can comment further. Watch out: if plumbing tees are installed backwards or more-accurately, upside down, that's a sign of an inexperienced plumber doing the work. You need to be alert for other drain-waste-vent plumbing mistakes and problems. Fix those now, before the walls and ceilings are enclosed or you'll face greater costs later. The IPC is available for adoption by jurisdictions ranging from states to towns, and is currently adopted on the state or local level in 35 states in the U.S. The IPC is built on the proven legacy of the BOCA National Plumbing Code, SBCCI Standard Plumbing Code, and ICBO Plumbing Code. How far can the plumbing vent piping be located from a plumbing fixture? Continue reading at PLUMBING VENT DISTANCES & ROUTING - routing & clearance distances for plumbing vents, or select a topic from closely-related articles below, or see our complete INDEX to RELATED ARTICLES below. Or see PLUMBING VENT CODES & DEFINITIONS FAQs - questions and answers posted originally on this page. 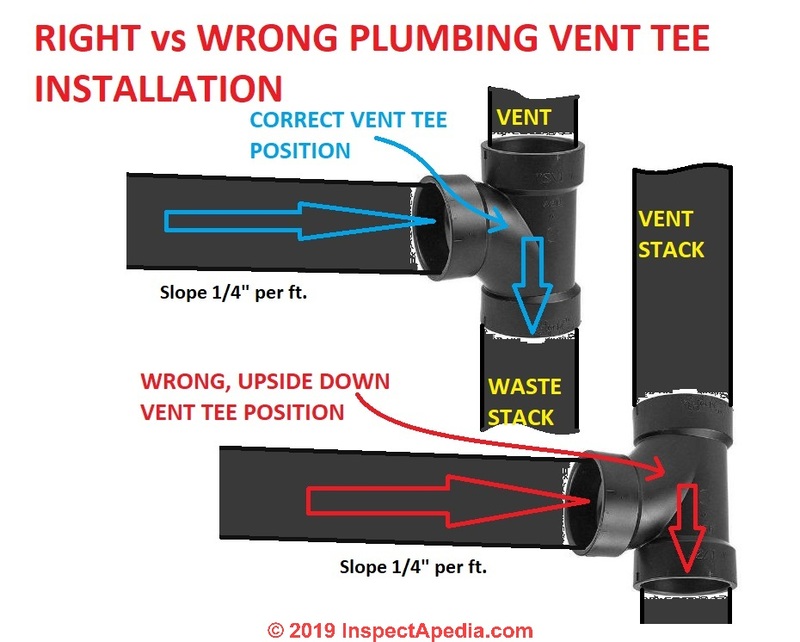 PLUMBING VENT CODES & DEFINITIONS at InspectApedia.com - online encyclopedia of building & environmental inspection, testing, diagnosis, repair, & problem prevention advice.